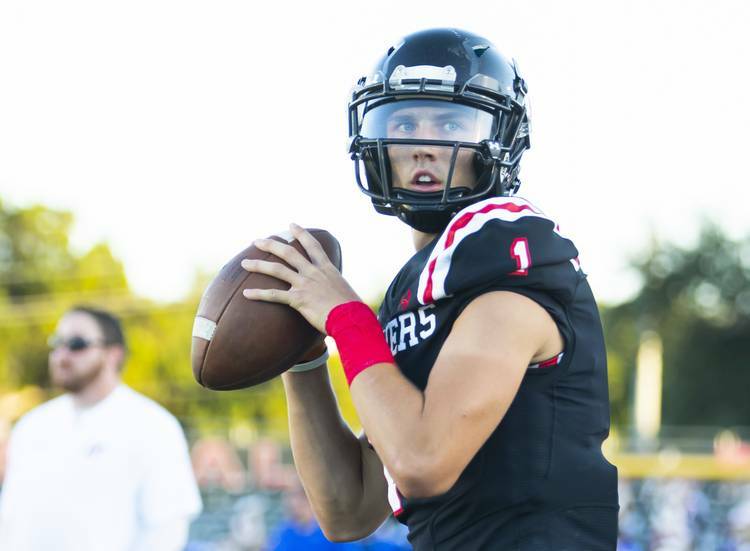 The legacy of elite quarterbacks at Lake Travis High School dates back to 2014. Every starting quarterback since that year signed with an FBS program. Ohio State head coach Ryan Day once joked with head Cavaliers coach Hank Carter that Lake Travis was the only place he needed to recruit quarterbacks when the Buckeyes were busy signing Matthew Baldwin in 2018. The next in line is Hudson Card, a Texas commit. The four-star dual-threat prospect is entering his second season as the quarterback for the Cavaliers. The 6-2, 179-pound athlete is the No. 17-ranked player on our 2020 Fabulous 55 and the No. 2-ranked dual-threat quarterback in the country, per the 247Sports composite rankings. Card is an incredible athlete, recording more than 1,000 yards as a wide receiver his sophomore year as he waited for Baldwin to graduate. Lake Travis is clearly Card’s team in 2019 with five-star wide receiver Garrett Wilson off to Ohio State. It’s a role that Card accepts. Card made a relatively smooth transition to quarterback last year. He was a quarterback playing wide receiver, not the other way around. The plan when he moved to Lake Travis from Cypress was to start at quarterback for the Cavaliers; he threw for 3,543 yards and 50 touchdowns to just four interceptions as a junior. He also rushed for 619 yards and nine touchdowns. He became Texas’ first commitment of the 2020 class on May 25, 2018. He grew up a Longhorns fan and was at the Orange-White game on Saturday to take in the atmosphere and help recruit. Texas has signed back-to-back No. 3-ranked recruiting classes and many of those prospects are expected to start in 2019. Card’s head coach has watched his development and thinks the Longhorns are getting a fine prospect. Card is admittedly lanky. He’s working to change that and is up 10 pounds from his junior season. He hopes to add at least five more pounds before his senior season. An offseason or two with UT strength and conditioning coach Yancy McKnight would surely help build his muscle mass and help his arm strength. Card recently achieved a childhood dream by qualifying for the Elite 11 quarterback camp that coincides with The Opening. Texas’ last quarterback commit to make it to the final 11 at The Opening was Sam Ehlinger, a product of nearby Westlake. And if you’re worried about Lake Travis’ quarterback situation once Card departs for Texas, don’t. Sophomore Nate Yarnell is a 6-5 pocket passer with a cannon for an arm who’s waiting his turn. “He’s going to be good,” Card said of Yarnell with a smile. Texas has yet to land a commitment on the defensive side of the ball. It inched closer to landing four-star safety Bryson Washington on Tuesday night when the Houston C.E. King star announced a top two of Texas and Oklahoma. The 6-2, 196-pound prospect is the No. 24-ranked player on the 2020 Fab 55 and is among Texas’ top targets. He’s a long, fast safety capable of playing deep or at Rover. Washington will take his official visit to Texas on June 4. He’s indicated in the past that a commitment could come on July 4. Washington, Duncanville’s Chris Thompson Jr. and Alvin Shadow Creek’s Xavion Alford are the top three safeties on Texas’ board. It’s an important year at safety for the Longhorns with Caden Sterns and B.J. Foster already playing at a level suggesting an early exit to the NFL. Thompson plans to take an official visit to Texas on May 4.